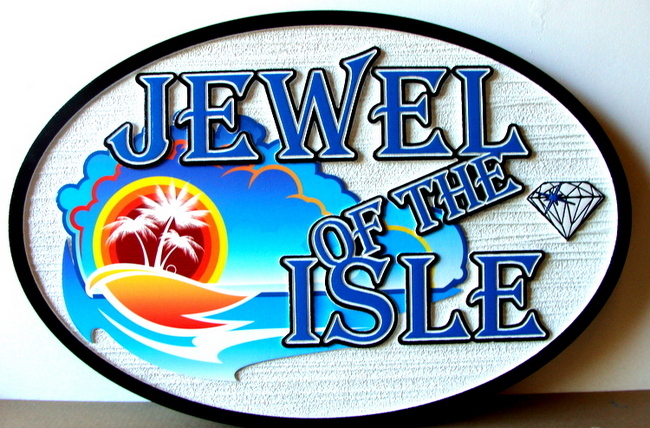 Above is a beautiful and colorful HDU sign for a Jewelry Store, "Jewel of the Isle". The sign is sandblasted to give it a wood grain appearance. The outline lettering as well as the diamond logo, island with sun, waves and palm tree, and sign borders are carved in 2.5-D (raised, flat relief) and artist painted with bright, long-lasting sign enamels. The sign is completely waterproof, and is clear-coated twice for UV protection. This sign can be mounted on a wall, displayed in a window, or hung from a ceiling beam or wrought iron scroll bracket.